Explanation: Can a cloud love a mountain? Perhaps not, but on a Valentine's Day like today, one might be prone to seeing heart-shaped symbols where they don't actually exist. 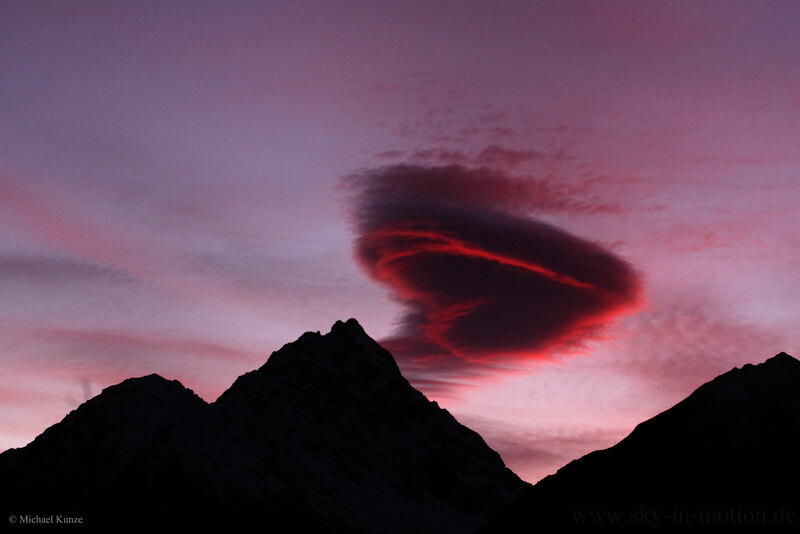 A fleeting pareidolia, the featured heart was really a lenticular cloud that appeared one morning last July above Mount Cook National Park in New Zealand. A companion video shows the lenticular cloud was mostly stationary in the sky but shifted and vibrated with surrounding winds. The cloud's red color was caused by the Sun rising off the frame to the right. Lenticular clouds are somewhat rare but can form in air that passes over a mountain. Then, vertical eddies may form where rising air cools past the dew point causing water carried by the air to condense into droplets. Unfortunately, this amazing sight made the fascinated videographer late for breakfast.